Pre-operation heavy equipment inspection checklists help you to identify potential problems - before you begin using your machine. 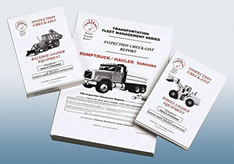 These carbon copy books make it easy to keep accurate, consistent records, keep your equipment in excellent running condition and help to prevent accidents and unnecessary downtime. VISTA offers over 50 checklists, for just about every type of equipment. If you don't see what you're looking for in our online store, please contact us. Electronic inspection checklists are also available for smartphones and tablet PCs. Vinyl pouches to store the checklists on your equipment. We also have titles that are not listed on the site. For more information about these heavy equipment pre-use inspection checklists, please contact us at 800-942-2886 or 262-514-2886 or via e-mail at info@vista-training.com.